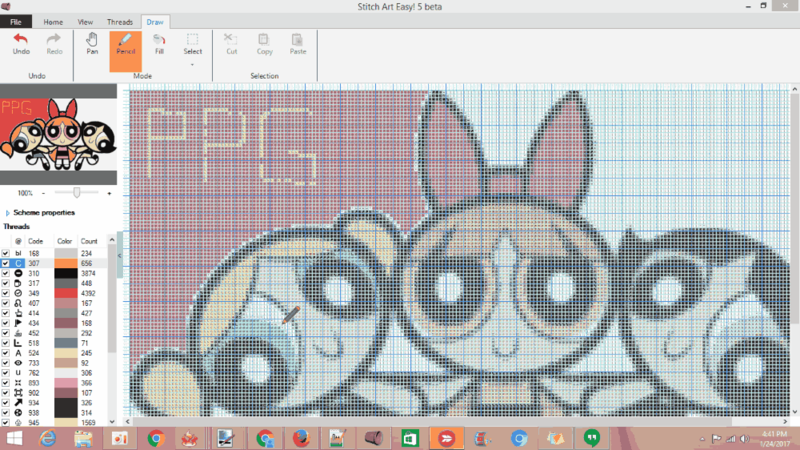 Here is the list of some of the best Cross Stitch Design Software for Windows that let you convert any image into a cross-stitch pattern. If you love the art of cross stitching and are searching for a free software, you have come to the right place. The list of free cross stitch design software provided below will fulfill your needs of embroidery. Check out the list of free cross stitch software and download the software that you like the most. Some of these software come with a number of stitch patterns like Cross Stitch, Three Quarter Stitch, Quarter Stitch, Half Cross, and Petite Cross Stitch, while some of these come with different types of embroidery views, namely Symbols view, White Symbols view, Colored Symbols view, Half Tone view, Full view, Colors view, and Stitches Preview. You can also adjust the size of pixels, change color, hide or show grid lines, and do much more to your project. 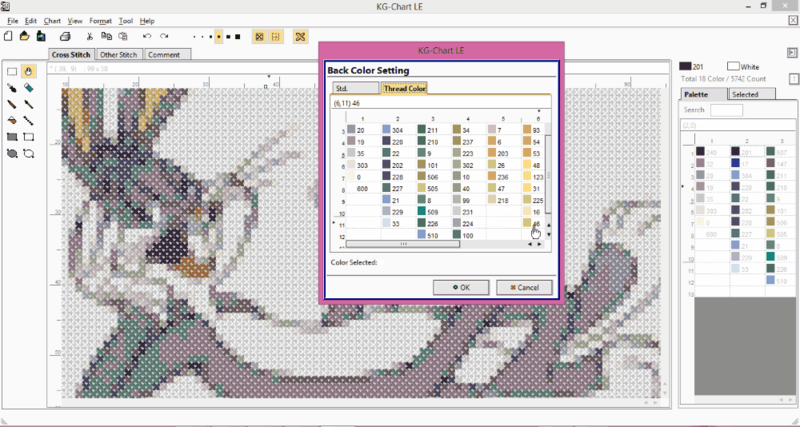 The Cross Stitch Design Software that I liked the most during testing is KG-Chart LE. I have placed this software first in the list because of the features it offers. It comes with a number of hand embroidery stitches that make the designing process easy. Some of these embroidery stitches are Cross Stitch, Three Quarter Stitch, Quarter Stitch, Half Cross, and Petite Cross Stitch. You can comment on the design you have created in this software. You can also remove a particular stitch with the help of an eraser provided in the software. KG-Chart LE is one of the best free cross stitch design software. Using this free cross stitch software, one can convert any image into an embroidery image in just a few steps. So, this is a good free image to cross stitch pattern converter. Just provide the image to be converted to cross stitch, and this will quickly do that. This software comes in two different modes for creating a stitch pattern namely, Cross Stitch mode and Other Stitch mode. Each of these modes contain a number of stitch patterns that will make embroidery designing easy. In Cross Stitch mode, you will find five different types of Cross Stitch Patterns, namely, Cross Stitch, Three Quarter Stitch, Quarter Stitch, Half Cross, and Petite Cross Stitch. If you want to design a framed stitch pattern or fill stitched pattern of a particular shape, that option is also available in the software. Only two types of shapes are available in this software: rectangular and elliptical. If your design requires stitching patterns other than cross stitch design, Other Stitch mode is provided for that purpose. In this designing mode, you will find more than 15 stitching patterns. Some of these patterns are Back Stitch, Straight Stitch, French Knot, Four Sided Stitch, CutLine Stitch, etc. You can also add comments to your designed pattern. 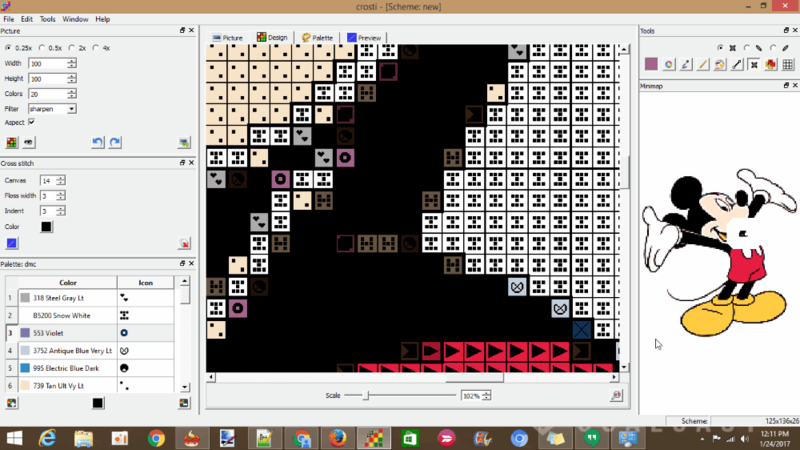 You can show or hide grid lines and symbols in an image. On clicking real view option, the software will show you the real pattern as designed on a fabric. You can also change the color of sheet and thread. This software can zoom in your design up to 10 times than that of the original. An eraser is provided in the software with the help of which you can erase any accidentally stitched pattern or simply you can use Undo button. You can export your cross stitch design only in 8 different types of formats. These are Bitmap, JPEG, PNG, TIF, ICON, TGA, PGX, Jpeg-2000. You cannot export your design in PDF format. Let’s see how to use this free cross stitch design software for creating a cross stitch image: Start with opening an image of which you want to create a cross stitch pattern in the software. After that, select the detailing option for your image and click on Create Design Button. After clicking Create design Button, the software converts that image into a stitched pattern automatically. If you want to create both single and double stitches on your image, marking option is provided for that purpose in the software. You can change colors and icons of stitched image. You can also reduce color in cross stitch design. You can also change border width of each box in stitched pattern according to the thickness or number of strands of a thread you are going to use to create a cross stitch pattern. For your convenience, this free cross stitch software displays image with a number of icons. If you want to see only a grid view of your image, you can hide these icons. You can also apply filters to your image. Some of the filters available in the software are Sharpen, Smooth, Blur, Motion Blur, etc. You can also add or remove more color palettes. After you have finished editing, you can save cross stitch pattern as image in different formats, like pdf, png, jpg, jpeg, etc. For taking a print out of your image, click on print option in File menu or simply press Ctrl+P button. Cstitch is another free cross stitch design software in this list that lets you design a stitched pattern for any image. Select any image from your gallery for creating a stitched pattern and open it in Cstitch. This software does not require any installation on your computer as it is a type of an executable file. You can run it on your PC directly without installing it. Explore your creativity by creating stitched images and save them in PDF format. You can create more than one cross stitch image of a single image and switch between them anytime. You can zoom in or out of cross stitch pattern. You can select whether to show or hide grid lines. You can also switch between pattern and square images. The cross stitch pattern created by this software contains a number of square boxes with different icons so that you can create stitch design easily. This software also lets you change the size of boxes before creating cross stitch pattern of an image. The cross stitch image created by the software consists of different symbols so that you could easily recognize each part of an image. You can also change the color and symbols of the image. It can save cross stitch image to multiple formats. Some of these are PDF, JPG, JPEG, BMP, PNG, etc. Another free Cross Stitch Design Software is Stitch Art Easy. Using this free cross stitch pattern design software, one can create stitch patterns in just simple steps. Just select image from which you want to create cross stitch pattern. Once done, you can export cross stitch pattern to PDF. You can create embroidery images easily. You can easily zoom in or out of the image with the help of a slider. This software shows you 7 different types of embroidery views, namely Symbols view, White Symbols view, Colored Symbols view, Half Tone view, Full view, Colors view, and Stitches Preview. 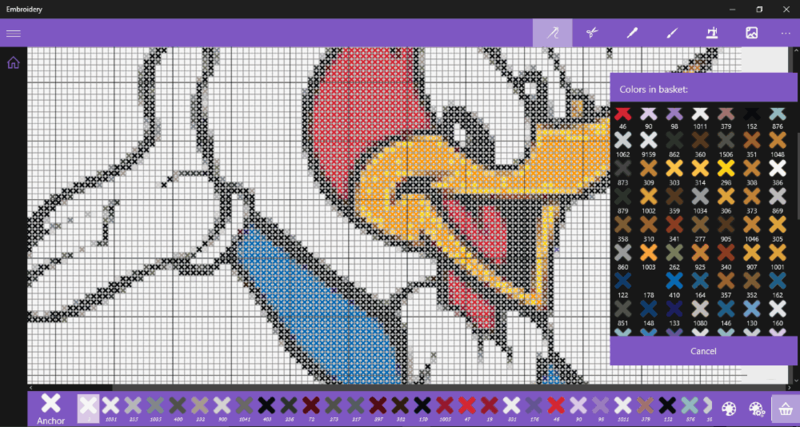 You can also show or hide rulers and grid lines on cross stitch pattern. You can use fill tool to color different parts of an image. Besides this, you can copy or cut, and paste the selected region of the image to another location. A pencil tool is provided in the software which lets you write on an image. You can also change the symbols shown in stitched pattern of an image. After you have finished, you can save your project to PDF format. Do note that newer versions of this software are paid, but its old version is still free. Download link below links to the older version of this software. 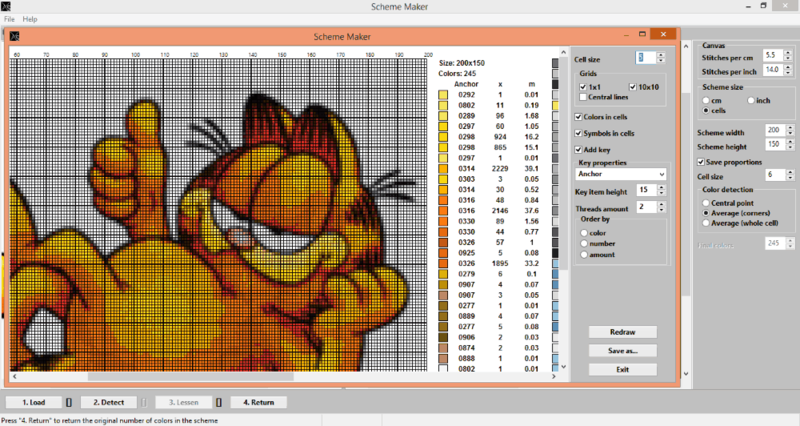 Check out Scheme Maker, one more free cross stitch pattern software for Windows. One can design a cross stitch pattern of any image in just three simple steps by using this freeware. Start with opening an image in the software, then click load button, after that, click on Detect button, and at last, click on Lessen button, and finally, you will get a cross stitched image ready for editing. It is pretty simple to use this free image to cross stitch converter. You can change the width and height of an image by increasing or decreasing the number of cells. If you want more details in your stitched image, increase the number of cells, and vice versa. 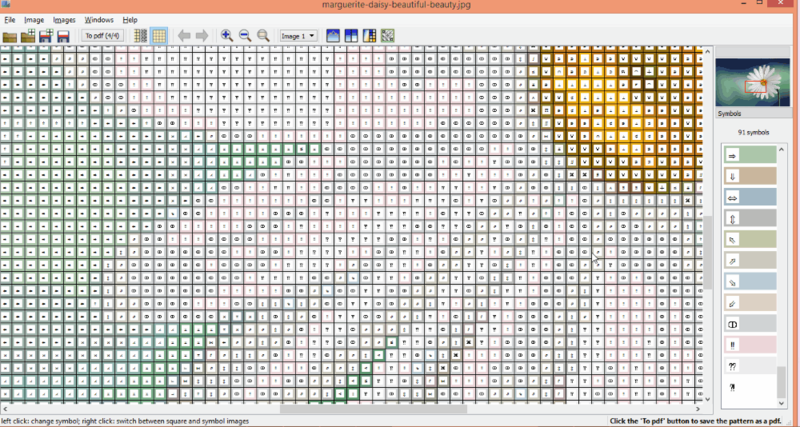 This software shows three types of grids in an image namely, 1×1 square boxes, 10×10 square boxes, and central lines. You can select whether to hide or show any or all of them in your image. If you want to hide your image, simply deselect ‘Colors in Cells’ option. You can compare stitched image to the original one anytime while editing. You can save the final image to many formats. Some of these formats are Bitmap, Portable Pixmap, Pixmap, Icon, PNG, JPG, JPEG, etc. 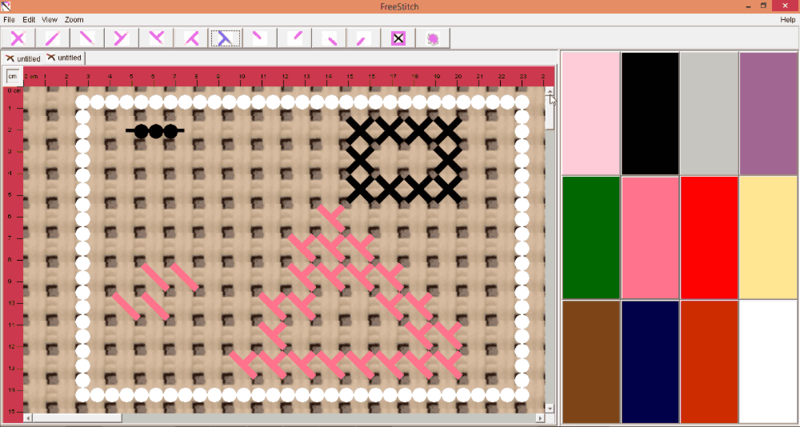 FreeStitch is a free cross stitch design software for Windows. You can create your own cross stitch design using this software. This software can zoom in and out of a cross stitch pattern up to 10 times than that of the original. Do note that this software is old and doesn’t seem to have been updated in quite a while. In fact, many important features are missing. You cannot even export your design or print it. So, the design that you create here would be pretty much useless. The reason I have still included this here is because the interface was bare bones, and if you want to introduce kids to very basic cross stitch design, then this could be one of the tools you explore. However, for any regular cross stitch designing needs, this software can definitely be skipped. You can create any type of pattern for your cross stitch project using this software. It comes with a number of stitching patterns namely, Cross Stitch Pattern, Three Quarter Stitch Pattern, Quarter Stitch Pattern, Straight Stitch Pattern, etc. Select the pattern according to your project. You can also change the color of thread for your project. It features three types of viewing options. These are Realistic view, Simple Grid view, and Blank view. Realistic view shows you the real view of your project as designed on a fabric. Simple Grid view displays your project with grid lines. Blank view hides all the grid lines from your project. You can create more than one cross stitch design at a time. It opens every new design in a new window so that you can easily switch between them anytime. You cannot open any image in this software for cross stitching as it only supports files of its own formats. Export and import options are not available in this software. You can save your project only in its own format. If you are searching for a free Windows 10 cross stitch app that can convert any image into a cross stitch image, install Embroidery. Embroidery is one of the best cross stitch design apps for Windows 10. Using this app, you can create an embroidery design with cross stitch patterns quickly. How to use Embroidery App: Start by opening an image in the app, after that, select the size of crosses, and the number of horizontal and vertical crosses you want to view in your cross stitch project. After you are done, click on Create button and this Windows 10 cross stitch app will create cross stitch image automatically. You can also reduce colors of an image before creating its embroidery pattern. This embroidery designing app contains more than 100 colors in its color basket. You can select any color from the basket for stitching. The app features a custom color palette using which you can create stitches of your own colors. This app shows stitched image along with grid lines. If you don’t want to see an image without grids, that option is also available in the app. This cross stitch pattern maker app comes with four different types of tools, namely, Needle, Scissor, Dropper, and Pattern. With the help of Needle tool, you can create cross stitches in an image while on the other hand, Scissor tool lets you cut or erase any stitches. You can fill many colors in your project with the help of Pattern tool. Dropper tool lets you transfer color from one part of an image to another part. GIMP is a very popular free image editing software. You can use GIMP to create cross stitch patterns as well. 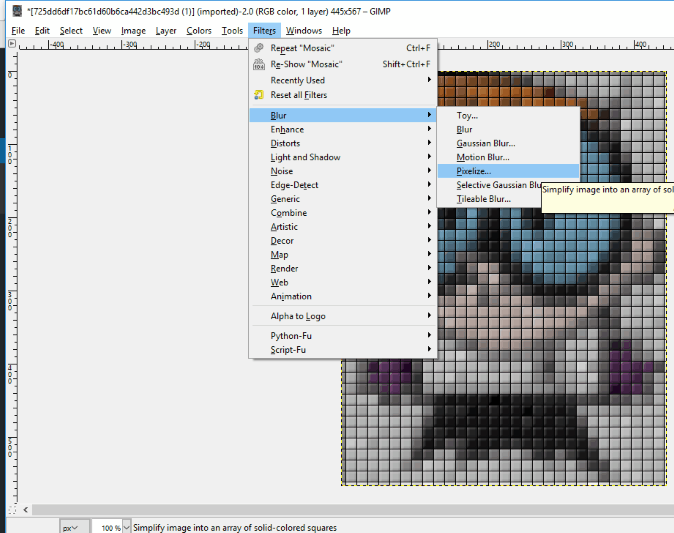 GIMP lets you convert any image into a pixelated image so that you can easily make a cross stitch pattern for that image. You can create four different types of pixelate patterns for your image, namely, square pattern, hexagonal pattern, octagon and square pattern, and triangular pattern. You can also adjust the size of each tile in your project as per your convenience. You can also highlight the grid lines in your image. After you have finished, take the print out of the image and make it a masterpiece. Open an image in the software by clicking open option in File menu or simply by pressing Ctrl+O button. After that, click on Filters>Blur>Pixelize. Then, click on Filters>Distort>Mosaic. This will open a window in front of you in which you can adjust tile size, height, spacing, and color variation as per your project. Move the tile slider to 1.00. This makes the shape of each tile perfect. At last, click on OK button. Congratulations, you have created a pixelated image. Get a print out of that and and use it as pattern for Cross stitch designing.